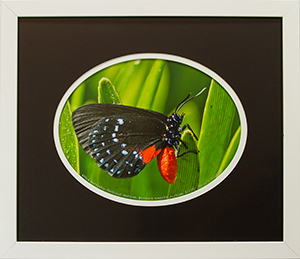 Atala Butterflies are small (up to about 1¾ inches). Coontie is their only host plant. 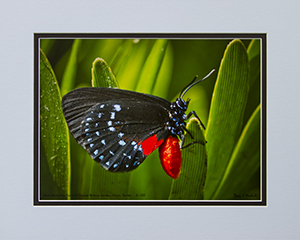 Commercial harvest of coontie in the late 1800s drastically reduced the Atala’s numbers and later loss of habitat to urbanization almost did them in. They were considered extinct from the mid-1960s until rediscovered on Key Biscayne by South Florida naturalist Roger Hammer in 1979. 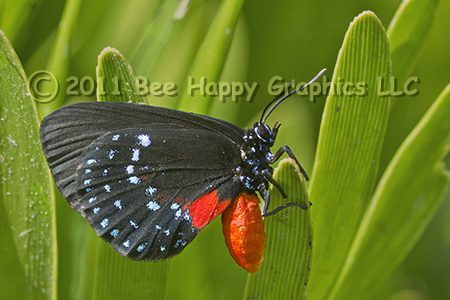 Atala butterflies spend 4 - 5 days as eggs. Larval stages take 18 days. The pupa lasts ten days, and finally, the adult lives another ten days. During that last ten days, a female Atala will lay up to forty eggs. 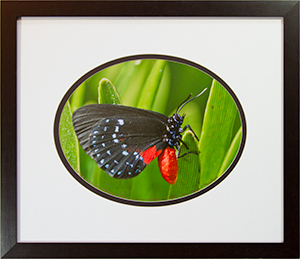 To see an example of this image framed, click here. Answers To Your Butterfly Questions. Photographic details: Canon EOS 7D camera w/ EF 100-400mm f/4.5-5.6L IS USM lens set at 100mm. Camera was set for f/11 on aperture priority with no exposure compensation, resulting in a shutter speed of 1/640 sec at ISO 4000. Fine Art Paper 11" x 15" 141/2" x 20"
Canvas N/A 191/2" x 27"